Q: What was their relationship during ROSE MARIE? A: For awhile it was great, though during the summer of 1935 they had their ups and downs. 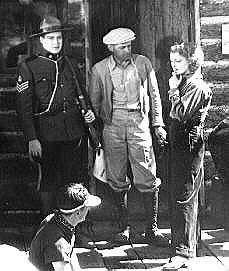 Jeanette met Gene Raymond; Nelson dated a few women. Nelson wanted to marry Jeanette but he also wanted her to give up her career, feeling that their marriage would never work with both of them competing professionally all the time. She was certain she could manage both a career and a marriage. Neither was willing to compromise. At romantic Lake Tahoe, where the ROSE MARIE location filming was done, their relationship changed. This time when Nelson asked Jeanette to marry him, she accepted. …but Jeanette discovered she was pregnant. 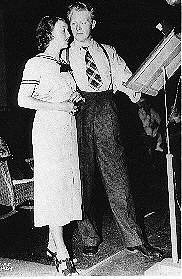 Nelson wanted to elope to Reno, but Louie B. Mayer stepped in, demanding Jeanette give up Nelson and get an abortion. She miscarried, but Nelson was convinced she’d listened to Mayer and he broke up with her. 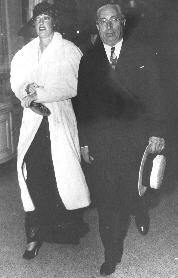 Here is a photo of Jeanette and Louie B. Mayer… the boss Nelson hated. Mayer hated Nelson as well and was determined to sabotage Nelson as he had done with other stars who were “troublemakers.” He gave instructions for his makeup to be changed… for the worse. Some of Nelson’s scenes were re-shot back at the studio with cheap backdrops. An “echo” duet between him and Jeanette was completely scrapped. 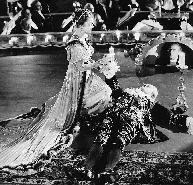 If you watch ROSE MARIE you will see certain scenes, such as when he sings “Indian Love Call” to her the first time, where he looks great. In later scenes, his makeup is laughable. The “Mayer Treatment” may have worked on John Gilbert, Ramon Novarro, Lillian Gish and others, ruining their film careers. In Nelson’s case, it backfired. ROSE MARIE was a bigger hit than NAUGHTY MARIETTA, and Nelson was now the highest paid singer in the world! Q: What happened in 1936? A: The first part of the year, Nelson was on concert tour. He usually started the tour in January, singing locally in case he was needed to finish a film. Then he traveled the country from February until May. While this tour was more successful than any previous one, Nelson voiced his bitterness about Jeanette and Hollywood in general in a nasty interview with reporter Sheilah Graham. The interview infuriated Mayer and humiliated Jeanette. She remained in Hollywood to film SAN FRANCISCO with Clark Gable and Spencer Tracy. 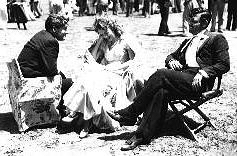 Not only had Nelson hurt her by claiming that there was no actress that he’d even “vaguely like to marry,” but Gable was Nelson’s friend and was hostile to her during much of the filming. 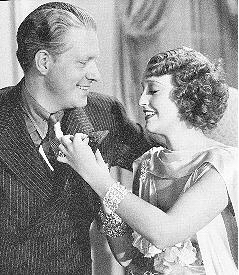 Jeanette’s weight fell to a dangerous-for-her 110 lbs and only her professionalism and the help of her friend and director Woody Van Dyke got her through the film. It was during this time that she also began seeing more of Gene Raymond. Q: Why did they make MAYTIME? 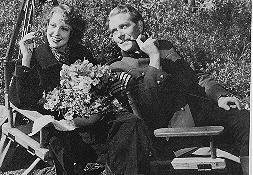 Filming the first MAYTIME was personally a nightmare for Nelson, because the first week of shooting, Jeanette announced her engagement to Gene Raymond. Nelson had tried to patch things up with Jeanette. They were seen again at the Hollywood hot spots together for awhile but once again there was a blow-up. In the end it was Nelson’s temper and inflexibility over Jeanette’s professional future that did the relationship in. 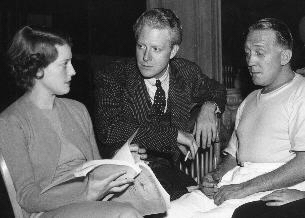 In the photo below, the animosity between the two is plainly seen, and the director Edmund Goulding looks like he’s not too thrilled with his stars. 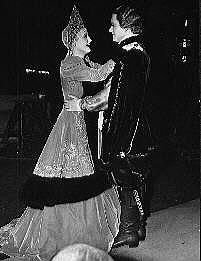 There are few candids of Jeanette and Nelson from this production and none in which they are smiling at each other. Production of MAYTIME came to a halt when Irving Thalberg died. The stars were given a month off while Mayer insisted all that all the footage from the first MAYTIME be scrapped and a new script written. The result was the second MAYTIME that we know and love, with a new supporting cast and director, Robert Z. Leonard. Even at their most miserable, they were forced to record together and Nelson, as usual, has his arm around her. Note the wicker rocking chair behind them; Nelson bought it for Jeanette so that she could rest during the long recording sessions, as she tired easier than the others. a handkerchief. Notice how rigidly Nelson holds himself; the body language is very different later in the filming, as we will see. 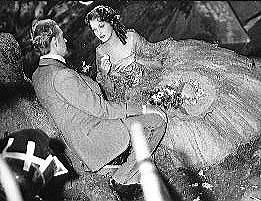 In the end, director Leonard told Nelson not to look at Jeanette but to sing to the tree behind her. You can see Nelson doing this in the film, plus if you keep your eyes on him during the song even when the camera is on Jeanette, you can see him blinking back tears. At last they reconciled. 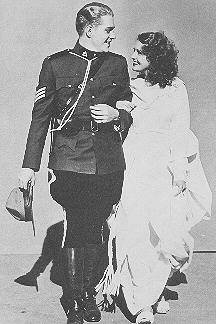 Both Gene and Anna MacDonald, Jeanette’s mother (who was pushing the marriage to Gene because she disliked Nelson) were barred from visiting the set. When Jeanette and Nelson were “together,” there was no mistaking it, as demonstrated by this intimate candid. And this one. Nelson is so transparent in his feelings; when he’s happy his face lights up, he beams with pride and the sadness in his eyes disappears. He’s also usually touching her or holding her. Q: If they really loved each other, why didn’t they marry? A: There were two main problems. 1) Mayer was pushing for the Mac/Raymond marriage, stating that he didn’t care who Jeanette married as long as Nelson lost out. 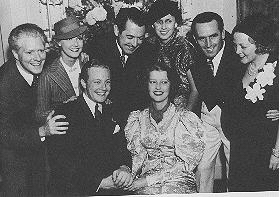 While Jeanette’s marriage wasn’t arranged, Mayer was known for “forcing” stars’ marriages if he thought it benefited either the studio or the actor’s reputation. If they went against his wishes, they could be blacklisted. 2) While Jeanette might have defied Mayer, she was not about to do so when Nelson once again asked that at least cut back severely on her career once they were married. 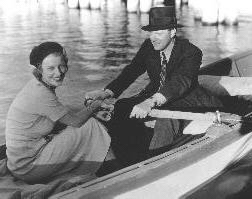 He wanted her to accompany him on his 1937 tour; he didn’t want a relationship where they were separated for months at a time. But she was scheduled to film THE FIREFLY while he was gone. Nelson finally broke up with her, deciding he was through playing second fiddle to her career. Here is a shot from Jeanette’s engagement party. 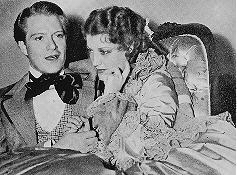 While Nelson looks happy, he’s dating the girl next to him, Anita Louise, who had been Jeanette’s good friend. Jeanette, although smiling, has a vacant look in her eyes. Nelson’s 1937 tour began well. Defiant, he was determined to forget Jeanette; had a brief romance with blond young newspaper gal May Mann and proposed marriage to her. She turned him down, claiming she was just starting her career. From here Nelson went downhill fast. A month into the tour he fell ill and was hospitalized twice. After a two-week rest he was able to finish the tour. 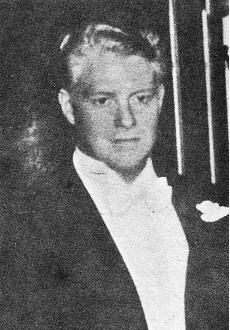 Nelson sang at Jeanette’s wedding on June 16, 1937, and looked miserable. 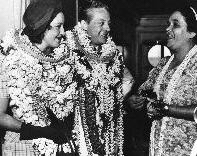 Jeanette and Gene honeymooned in Hawaii and from all appearances, the marriage seemed happy. Nelson remained depressed during the summer of 1937. 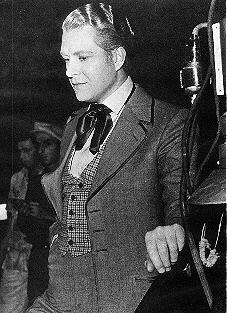 He filmed ROSALIE with Eleanor Powell and dated “about a dozen girls all summer.” Here’s a candid of him taken at that time; note the sadness in his eyes. (c) 1999, 2000, 2005 by Sharon Rich. All rights reserved. All quotes were originally published (with their sources documented) in the book “Sweethearts,” (c) 1994, 2001 by Sharon Rich. All photos are from the author’s collection and have been reproduced either in “Sweethearts” or issues of the magazine “Mac/Eddy Today” and are under appropriate copyright.